Wipperman finally joins the 11-speed game with their Connex 11sO (nickel-plated) and 11sX (nickel plated w/ stainless steel inner links) chains. There was a time during the early 10sp era when I pretty much used only Wipperman chains. You see, I had Dura Ace drivetrains, and since Shimano chains didn’t have a masterlink, I chose the drivetrain brand-neutral Wipperman chain so I could easily pull the chains off to fully degrease before re-lubing. I had also come across some independent testing that suggested that Wipperman 10sp scored best among 10sp chain wear resistance. That said, I have a tendency to sprint hard at stop lights, either charging for a yellow light or punching it off the line when the red goes green, and I’ve ripped apart an awful lot of Wipperman chains (I kill other brand 10sp chains too). 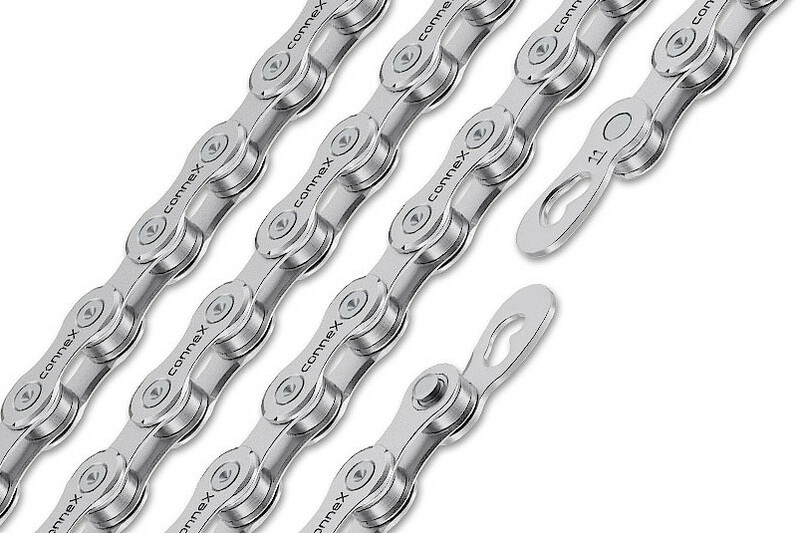 When I switched allegiance to SRAM drivetrains after Dura-Ace 7900, I just used SRAM chains, but I missed the easy disengagement of the Connex masterlinks (most other 10 or 11sp masterlinks are too tough to disengage with your fingers alone). I was surprised that Wipperman has taken so long to roll out an 11sp chain; I guess they finally decided to make their move before the market sailed away from them. Still, I’m not whipping out the plastic for a Connex 11sp chain just yet. I’ve more or less drawn a line in the sand at 10sp. Going to eleven cogs on the back of a road bike is faux progress. If you still prefer Shimano, well I would say that the 11sp groups from Shimano offer much better shifting because the shifters have a much smoother and refined action than the rather disappointing 2nd-gen 10sp groups (7900, 6700, 5700-series)…..but the fact they have another cog on the back just means that the chains and cassettes will wear out just that much faster. For SRAM, the last generation of 10sp Red has the same basic form and function as the 11sp-gen; I’m so pleased as is I have no desire to spend to update my bikes to 11-sp, not to mention my wheels which don’t accept 11sp cassettes. The one area of drivetrain development in which I grudgingly approve of 11sp is 1×11 mountainbike drivetrains (oh, I guess 1×11 gravel grinders too). If your cog range is 10-42 or 11-40, 10sp would leave awfully big ratio jumps somewhere in cassette, but ditching a front derailleur and lefthand shifter is worth the less durable chain and slightly more finicky cable adjustment of 11sp in my book. To put a finer point on it, I race CX with a 1×10 drivetrain because there is no CX course in my neck of the woods that requires something lower than a 38×28 ratio. I don’t feel that an eleventh cog offers anything to gain in a 11-28 or 12-27 cassette range, so I am satisfied with ten cogs in total on the back. If you needed to run 11-32 on your CX bike, I could see a marginal benefit for 11sp, but It won’t put you at the top of your local series if you weren’t already on the heals of the leader. And if you are looking for something to keep you from getting lapped by the leaders at every race, an eleventh cog should be pretty low on your self-improvement agenda. One last issue about Wiperman chains is that I haven’t been able to use a Connex chain on my wide-narrow chainrings in my 1×10 CX drivetrains, because the wide teeth won’t let the Connix chain fully enage. I wonder if Wipperman has taken steps to make their 11sp chains more compatible with 1x chainrings.